I hope your holidays were filled with family, friends, love and laughter. Mine certainly were and it was a welcome change of pace from the month of November when I busted out an additional room in our house. Yes, I added a room. You might recall that I once had a room for my crafts but I was evicted when we found out I was pregnant with little dude number 2. I moved my stuff out to a corner of the garage and landed here. I know what you're thinking, it's not too awful ... only it was. You see, it was NEVER that tidy again because it was too cold to work out there during the winter and too hot during the summer. It was dirty because there were no real walls to keep it separate from the rest of the garage and that little desk was never enough space for me. Furthermore, the only time it was well lit was during the day when natural sunlight flooded the space and that's all fine and good except I don't do a whole lot of daytime crafting, I'm a stay at home mom. 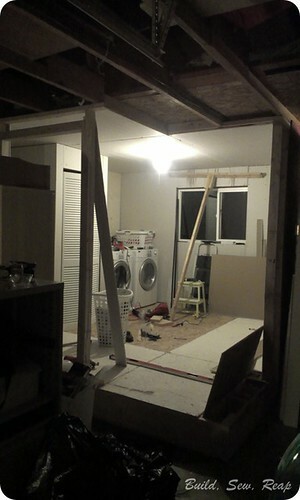 So, the hubs and I started talking and we decided that our 2 car garage with a 1 car opening was wasted space. 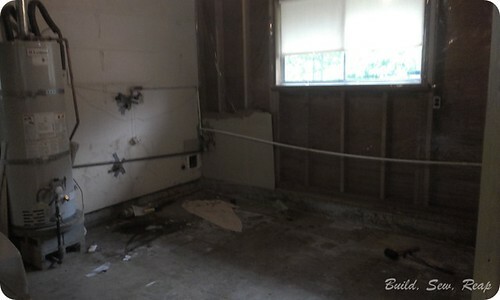 We decided to rip out the room we built him awhile back (that ended up having the same problems mine did ... cold/hot, dark, dirty) and build on two rooms just outside the main part of our house. 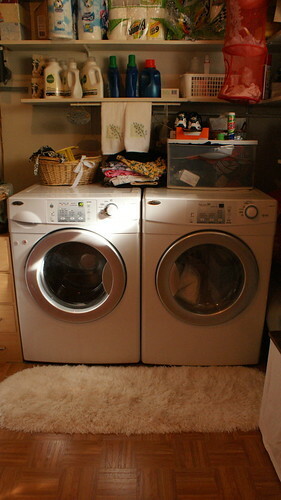 We used to step out of the living space, down to a stack of cinder blocks and onto the concrete garage floor to get to my craft space, laundry, the hubs' room, etc. but not anymore. 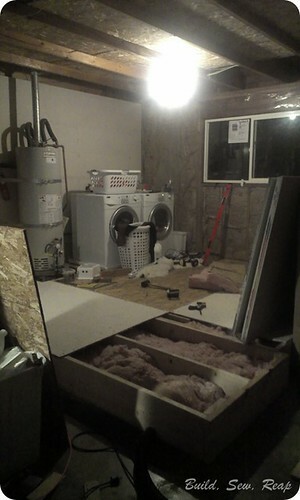 We sealed the concrete then built up the floor by 8+ inches, leveled it, added insulation and put down sub flooring. 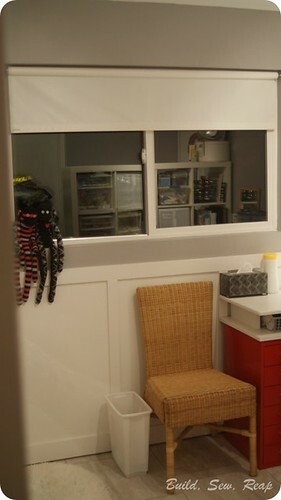 I added walls that hadn't been there before, built a closet around the water heater, installed a new window and started drywalling. 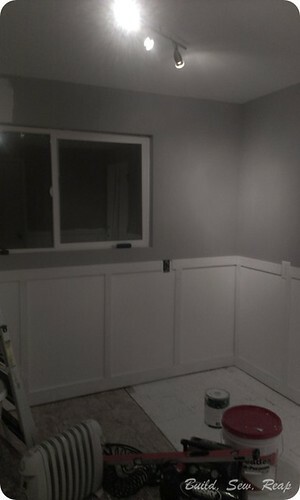 This was before I finished building the wall but was the last photo I was able to take of the entire room. Lots of drywalling and mudding then some fake board and batten which I created using some low budget particle board ripped into appropriate sized strips. 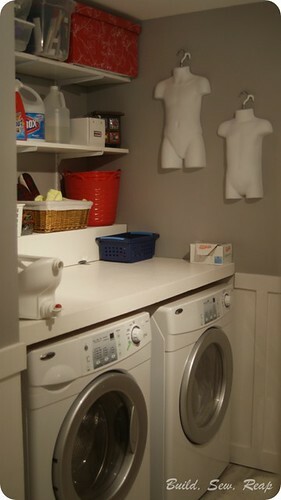 The counter above the washer and dryer is removable for maintenance and the shelves were recycled from the old laundry space. I've had those kid body forms since before I had real kids. 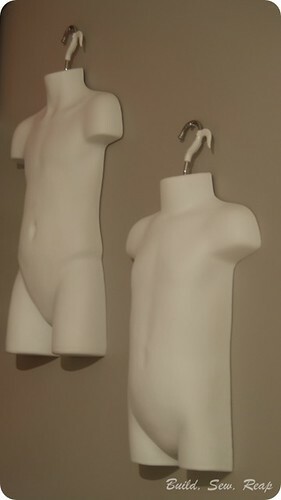 I used to use them when I photographed clothing for my easy shop. Well, they are now the same size as my two boys so they hold a special place in my heart ... and on my wall. My super handy neighbor came over and taught me how to remove an old single pane slider window and install a nice new double pane one. Bonus that this one has a screen and functioning lock. This is my new work space with custom "L" shaped desk that I cut from a nice piece of plywood. After cutting the pieces, I used the router to round off the top edge then I painted it with the same glossy white I used on the board and batten. I also found a place for some artwork I created many years ago using the pieces from the pattern for the first formal gown I made for myself. I've used this double layer desk system several times now and love it. 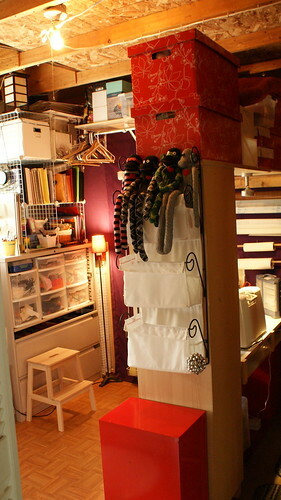 These baskets slide in and out nicely and now I have a tidy place to store all my ribbon. 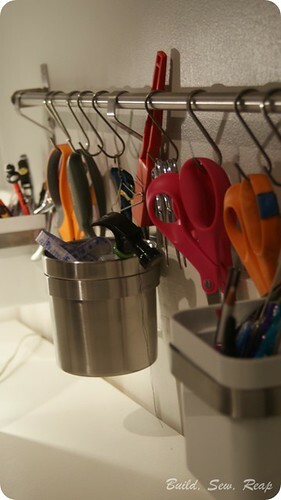 I treated myself to this great hanging system from Ikea so I'd have all my most used supplies organized at an arm's reach. 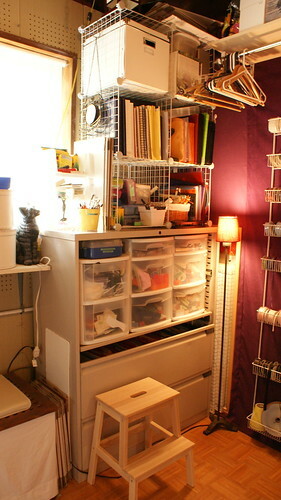 A little space to store larger items like cutting mats, a tabletop ironing board and rolls of contact paper and stabilizer. 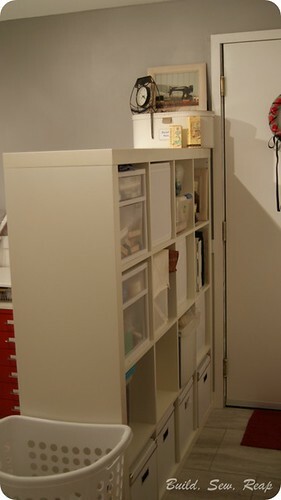 I had my eye on this Ikea Expedit shelving system knowing it would provide a good partial wall to separate my space from the passthrough from the house to the garage. 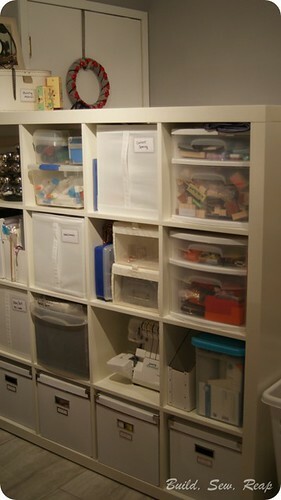 I love that all those boxes are accessible from either side of the unit. The Expedit from the other side. 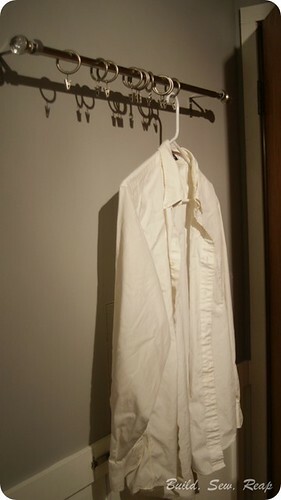 I hung this curtain rod up behind the door to the living room so we would have a place to store clothing waiting to be ironed. I didn't want them hanging in the doorway. 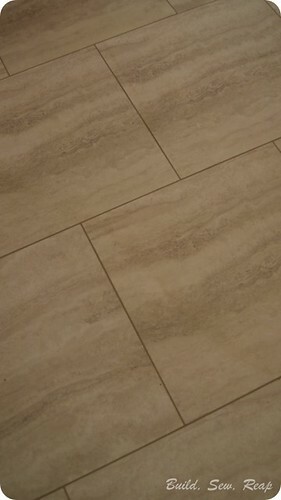 The flooring I used is a peel-and-stick linoleum from Lowes in 18x18 pieces laid with 1/8 inch space between them and grouted with special grout intended for linoleum tiles. I had no idea this stuff existed but when I saw it, I knew I had to give it a try. It looks stunning, particularly for peel-and-stick tile. I will never lay that stuff without grout again. This was a HUGE undertaking and should have taken far more than the few weeks that I gave myself but I'm not a patient woman. I still have some details to clean up in there but the big stuff is clearly finished. 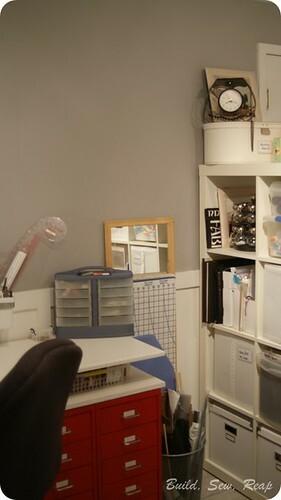 I've used the room a few times and love being able to just bounce out to my sewing machine which remains plugged in and ready to be used whenever I need to. In fact, I even made myself a skirt for New Years Eve! I hated having to bring my sewing machine in to the the dining room table as it meant I had to completely clean everything up before dinner each night. What a pain!! It won't be an issue any longer now that I have my own space. 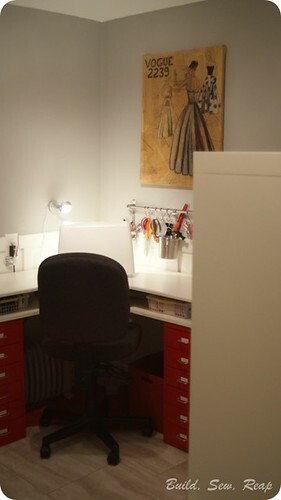 It is clean too, no more dust floating from my power tools and workshop into the craft space. Hey, you are doing a great job. I love your show and lately your website has been a real help for me. I really recommend other to read this article .Keep up the good work . Many thanks for ideas on this article. I suggest the others idea for project decorating home. Example exterior cinder block walls. Amazing works! I need to work on it. I also found a place for some artwork.